Are you tired of having to connect your iPhone to your computer to sync your photos and videos? If you are like most people you snap pictures, videos or screenshots and then have to either email them to yourself or sync with iTunes to get them out of your iPhone or iPad and into your Mac or PC. Now a new app from touchbyte called PhotoSync lets you wirelessly transfer your files to your computer and or sync them to Flickr. The app also lets you wirelessly transfer and receive photos and videos from other iPhone, iPod touch or iPads running the PhotoSync app. You can even push files from your computer to your device running this app. This is great for sending and getting photos from friends. 1) Sync New – will automatically find new items and sync them all for you. 2) Sync Selected – shows the number of items you’ve picked and syncs them for you. To send photos to your Mac or PC you first have to download and install the free Simple Transfer app for OSX or Windows. Once you run the app you it sits in your menubar or system tray and listen for incoming connections from the PhotoSync app. You can then start a Sync from your iPhone or iPad and send photos/videos to your computer. After you initiate a transfer from the app it automatically finds your computer and shows it in a device list. Just tap your computer name and PhotoSync transfers your selected items over to a new PhotoSync Camera Roll folder on your computer and automatically opens up the folder in Finder/Explorer. There is a progress bar showing the status of the transfers. The file transfers are quite fast (up to 2.5MB/second). You will notice transfers take much longer when copying movies. 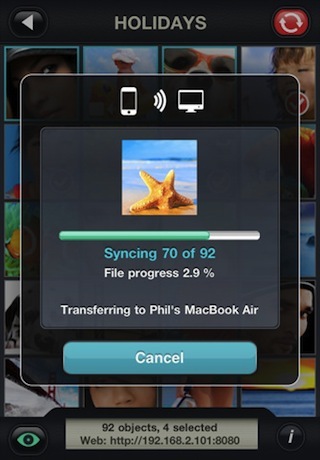 Once you start the transfer you can close the app and start multitasking and the sync continues in the background. You will get an alert message on your device when the sync is finished. The PhotoSync app even works with the iPad Camera Connector kit to transfer files wirelessly. If you can’t or don’t want to install the helper app on your Mac or PC, you can use the Web Sharing option to browse and download your media from a web page served by the PhotoSync app. Once you enable this option in the settings, you just browse to a local IP address on your local WiFi network and view the files in a nicely designed gallery style webpage. There are links to download the original and view GPS information on your photos. You can even download all the files in one large zip file via the web sharing option, though it takes a while to generate. This web sharing option is great if you’re on a public computer or at a temporary location and want to download a few files quickly. Otherwise, it is best to go with the native app for faster cleaner syncing. The PhotoSync app tracks the files you’ve transferred. This means the next time you want to sync files you can choose Sync New and it will automatically copy over all newly recorded photos and videos to your computer. Another advantage of this is that if for some odd reason your WiFi connection drops, the app can easily pick up where it left off to sync what was left over. The “new” items are noted by a blue border in PhotoSync. PhotoSync also works over Bluetooth for transferring between 2 devices, perfect if you are at a party or event and want to share photos and videos with friends and family members. Photos and Videos are transferred in their original size and format and your EXIF and GPS information is kept in tact. You can then easily drop your files into iPhoto, Aperture or Picasa for sorting. To make things simpler you can even go into the Receive settings for the PhotoSync helper app and choose either iPhoto or Aperture to automatically move synced files to those apps. Just as easily, you can copy photos and videos from your PC or Mac to your iPhone, iPod touch or iPad running the PhotoSync app. From your computer you just choose the “Send Photos/Videos” option or drag files on the app icon. From there you will see your device in a list. Pick it and your files get transferred over wirelessly. Finally, PhotoSync lets you upload your iDevice pics to Flickr directly. Authorize your Flickr account login info and start uploading right away. You can change privacy level for new uploads to Flickr, destination folder, and image size in the app settings. PhotoSync Companion runs using Bonjour and its own custom protocol which use the ports 5353 and 35722, so if you have issues make sure these are open in your firewall. Also make sure you have iOS 4.2 or higher and have location services turned on. Version 1.1 of PhotoSync has added support for: Dropbox, FTP, Airplay, and Multi file upload via web. Overall, PhotoSync is a must have utility app for fast and pain-free photo syncing. It does cost $2 but it will save you a ton of time. Let’s just hope Apple adds native iOS wireless sync sometime soon. Until then, PhotoSync is here to help. 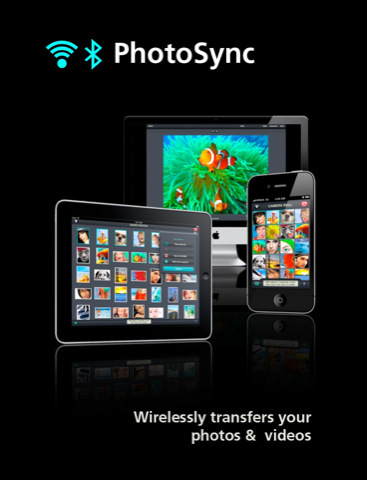 AppSafari review of PhotoSync – wirelessly transfers your photos and videos was written by Joe Seifi on March 29th, 2011 and categorized under App Store, Featured, Files, iPad apps, Universal, Utilities. Page viewed 7382 times, 1 so far today. Need help on using these apps? Please read the Help Page. What disturbs me enormously is that it reverses the order of pictures. The last one comes first etc.